“The sum of all of India’s traditions” | It's a Miracle! I am outraged and maybe for once, not without just cause. Ashutosh Gowarikar’s Swades is a Hindi film that I’ve mentioned before as one that I enjoyed watching. In this film, a scientist of Indian origin portrayed by Sharukh Khan (Mohan), visits India, builds a small-scale hydroelectric plant and falls in love with the village belle (Geeta). I know it sounds maudlin (and in fact it is, more than it sounds), but it pulls at some desi heartstrings. Towards the end, as Mohan’s vacation is up, he gets ready to return to the United States. He wants Geeta to come with him, but she refuses. Instead, she gives him a wooden box with all sorts of random seeds, twigs, and spices. For a few minutes, Mohan makes a face like he is going to pass a kidney stone (which is easy for the masterful Shahrukh Khan to do), but then he dutifully goes back to his job at NASA in the US where he then proceeds to stare at the things in the box while a soulful A.R. Rahman song plays in the background. It is all very tastefully done. Before Mohan leaves, however, Geeta mentions that this is no ordinary box: the objects in the box are representative of India’s culture. 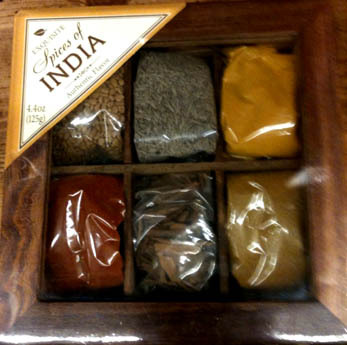 Well, you can imagine how I felt when I walked into World Market in San Diego today and discovered that they were selling a box of “exquisite spices of India” which looked a lot like the box that Geeta had thoughtfully packed for Mohan. I mean, just reflect on the horror: this was in World Market – the chor bazaar for upwardly mobile American latte liberals! I am infuriated. Whatever happened to the sanctity of Indian culture? I’m sure that box wasn’t even made in India. It was probably made in China. You’re right! Commercialization of desi-culture!! Of all the movies that Bollywood has churned out ,I think Swades has been by far the most inspirational one. Too bad people don’t realize that gimmicks like these dilutes cultures in the long run.But then again, everyone want’s to make a quick buck!